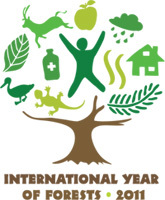 International Year of the Forest 2011 – a link to a MUST WATCH video below. We are very privileged to live in Muskoka where we enjoy healthy forests, with much natural cover. Although I am a volunteer with the Muskoka Watershed Council, I recognize the current and past work done by all the volunteers and staff of the MWC for 10 years now. With the release of the 2010 Report Card, benchmarks for future Report Cards have been established; best ensuring that we do not lose our incredible resource. Please watch this great, great video. Thank you!